To register online, a customer account must be created prior to registering for an activity. City of Mesa Parks, Recreation & Community Facilities offers a wide variety of sports programs to youth and adults with intellectual disabilities. Athletes participation in the sports programs with this symbol are eligible to compete in Special Olympics Arizona (SOAZ) competitions. The training schedule for each program is based on the competition schedule as determined by SOAZ. Fees collected for sports programs will cover the costs of staff, equipment and travel to competitions. Adaptive TGIF Social Club Thank Goodness It’s Friday (TGIF) Social Club The social club is designed for individuals with intellectual disabilities ages 16 and older who can function independently while in a group setting with the supervision of staff. Red Mountain Park Mallard Ramada 7745 E. Brown Rd. Join City of Mesa Parks and Recreation and the Arizona Game & Fish Department for a morning of fishing and fun! Equipment, bait and leadership will be provided. Fishing licenses are not required during the event for those who register at the event booth. This event is free of charge and open to all ages! Registration is on a “first come first serve” basis and is for full teams only. 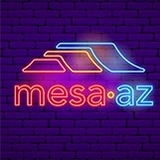 For on-line forms and more information on how to register, visit www.mesaparks.com/adultsports or call 480-644-PLAY (7529). Batter up! Softball is just around the corner! Call your friends and co-workers. Register your team on-line or on a walk-in basis. A variety of skill classifications and Men’s, corec and women’s leagues are available. Double header format and games start no earlier than 6:30pm. Registration is on a “first come first serve” basis and is for full teams only. For on-line forms and more information on how to register, visit www.mesaparks.com/adultsports or call 480-644-PLAY (7529). Come enjoy winter in sunny Mesa, Arizona. The City of Mesa, Parks & Recreation department offers a senior softball league during the winter (Jan-Feb). Registration takes place in mid-November and league play begins the first week of January. The league has five divisions of play ranging from very recreational (light-hearted competition) to competitive (geared toward the more advanced player). Registration is on a “first come first serve” basis and is for full teams only. For on-line forms and more information on how to register, visit www.mesaparks.com/adultsports or call 480-644-PLAY (7529). The City of Mesa offers a Friday night adult kickball league (must be 18 years or older to play). This is a recreational league (light-hearted competition). The season consists of 7 weeks of double header, round robin style schedule with a tournament for all teams at the end of the season. Games are 50 min long. Beer permits are available for purchase at our office. Games start no earlier than 6:30pm. Bring lawn chairs, drinks, food and friends. Headbands are encouraged. Registration is on a “first come first serve” basis and is for full teams only. For on-line forms and more information on how to register, visit www.mesaparks.com/adultsports or call 480-644-PLAY (7529). The City of Mesa offers a Thursday night Women’s volleyball league. Recreational & competitive leagues available. The season consists of 7 weeks of round robin style schedule with an end of season tournament for all teams. Each team plays one match per night, one match consists of 3 games. The first & second games are to 25pts and the third game to 15pts. Rally scoring is used. Games start no earlier than 6:30pm. All leagues are 6 on 6. Registration is on a “first come first serve” basis and is for full teams only. For on-line forms and more information on how to register, visit www.mesaparks.com/adultsports or call 480-644-PLAY (7529). Are you ready for some football? This flag football league has a recreational division (light-hearted competition) and a competitive division (geared towards the more advanced players). The league is an eight on eight player league and games start no earlier than 6:20pm. The season consists of 7 weeks of single games plus an end of season tournament for the top four teams. Is your child CONSISTENTLY comfortable in the water without an adult? Can your child float on their front unassisted and float assisted on their back in shoulder deep water? Can your child glide and kick on their front and back, alternating/simultaneous arm and leg action on front and back 4-5 arm strokes? Can your child swim 10-15 yards on their stomach and back and is comfortable in deep water? Can your child swim 25 yards of freestyle, backstroke, elementary backstroke, and complete a kneeling dive? Can your child swim 25 yards of all 4 strokes? CABS (Child & Babysitting) class. This course provides students with the knowledge and skills to confidently care for infants and school age children. Participants will learn how to respond to emergencies and illness with first aid and other appropriate care along with all of the babysitting basics. Students will receive a Babysitters Certification Card good for 2 years. This course also incorporates the latest science and teaches students how to respond to breathing and cardiac emergencies. Successful students will receive a certificate for Adult/Child/Infant CPR/ AED and First Aid valid for two years. Students should bring a non-perishable lunch or snacks. For more information on this program, contact Barb Kenney at 623-261-7005 or www.hearthealthyaz.com Registration fee: $10/$12 Mesa resident/non-resident. Contractor fee due first day: $80. Youth N.E.T Tournaments Tennis Junior N.E.T. Class designed for intermediate level players, introducing match play and entry level tournaments. For more Information please call the MTC at 480-644-3874, or 480-644-2352.Class designed for intermediate level players, introducing match play and entry level tournaments. For more Information please call the MTC at 480-644-3874, or 480-644-7529. Class designed for intermediate level players, introducing match play and entry level tournaments. For more Information please call the MTC at 480-644-3874, or 480-644-7529. This specially designed sport class by Stretch-n-Grow is for kids who want to build confidence, learn skills and build self-esteem in team sports. This is a non-competitive environment with emphasis on sportsmanship. For information on this program, and for discount on multiple Stretch-n-Grow class enrollments, contact Denise Trujillo: 480329-3674, sngeastvalley@gmail.com, www.stretch-n-groweastvalley. com. Registration fee: $10 Mesa resident/$12 Non-resident. Contractor fee due first day: $40. Contractor offers multiple class/child discounts. No refunds on contractor fee. Watch your princes and princesses shine in this fun and creative program. Children will be introduced to dance through their favorite fairytales. Soft soled shoes and comfortable clothes required. Ballet shoes, leotard and tights recommended. Children must be able to work in a group setting. There will be a performance the last day of class. For information on this program, contact Jana Moore: 480-363-9997. Registration fee: $10 Mesa resident/$12 non-resident. Contractor fee due first day: $35. No refunds on instructor fee. Each music and movement exploration class is filled with songs integrated with physical movement, dramatic imagination, exploration of instruments such as tambourines, triangles, maracas, drums and more. Our instructors will invite children to explore moving, singing, verbal and listening skills. For information on this program, and for discount on multiple Stretch-n-Grow class enrollments, contact Denise Trujillo: 480329-3674, sngeastvalley@gmail.com, www.stretch-n-groweastvalley. com. Registration fee: $10/$12 Mesa resident/non-resident. Contractor fee due first day: $25. Contractor offers multiple class/child discounts. No refunds on contractor fee. Kids will learn dance terminology and how to technically execute movements in Ballet and Jazz. This class is a great balance of discipline and fun, which will help build classical dance foundations. For information contact Jana Moore: 480-363-9997. Registration fee: $10 Mesa resident/$12 non-resident. Contractor fee due first day: $35. No refunds on instructor fee. Ages: At least 10 but less than 13	27616	Jan 14-Mar 4	6:00 PM-6:50 PM	M No class January 21 & February 18. Learn how to enhance your ballroom dance performance. This skill building class is for solo, couples and group performance. For more information contact Chad Lakridis: 602-549-1916 or chad@dancewithchad.com. Registration fee: $10 Mesa resident/$12 non-resident. Contractor fee due first day: $45. 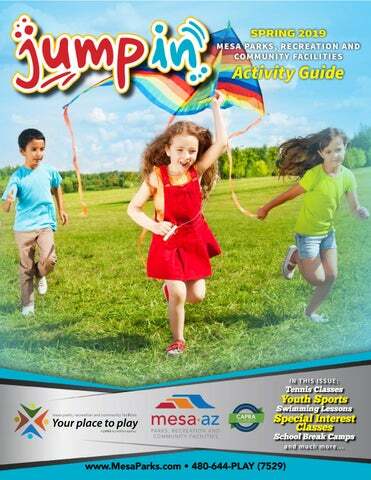 City of Mesa Parks and Recreation Spring 2019 activity guide.